Lon Lodges01597 810128work Self-cateringAward Winning 5-star self-catering lodges, offering a special holiday experience with private spa hot tub in the heart of Mid Wales and the Cambrian Mountains. 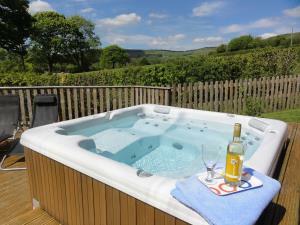 Both Lodges offer luxury accommodation with their own private hot tub. Each sleep 6 people in 2 double bedrooms & 1 twin room. Travel cot and Z bed available. Listed in 'Wales in Style' - a guide for the finest destinations and experiences that Wales can offer. Ash and Sycamore Lodges are situated on a family farm, 4 miles from the small market town of Rhayader. Both Lodges have been sustainably built using locally sourced timber and have a Gold award with Green Business Tourism Scheme. WIFI - free internet is available with a fair use policy. Relax and unwind. There are lots of wonderful walks, peaceful lanes to cycle and many mountain biking tracks. Nature reserves, pony trekking and fishing are nearby and the area is a bird watcher’s paradise. There are two Wildlife Nature Trails straight from the Lodge’s doorstep. Cosy and warm in winter with under floor heating and patio doors for summer outdoor living. The lodges are non smoking environments. Beds are made up with Luxury Egyptian cotton sheets prior to arrival. Heating & electricity included in price. An open plan living area with leather sofas, electric wood burner effect stove, LCD TV with Sky Freeview, DVD player & DVDs, CD/radio, games & books. A modern, well equipped kitchen with dishwasher, large fridge/freezer, washer/dryer, eleectric fan oven/grill/hob and microwave. Family bathroom has a bath with overhead electric shower, wc, vanity unit, heated towel rail, lighted mirror and shaver socket. There is a separate cloakroom toilet. An entrance lobby has hanging space for coats/ shoes with a welly rack outside! Each lodge has a private and safe fenced garden with patio area, lawn, garden furniture and their own private spa hot tub that runs all year. A personal, lockable garden store holds recycling facilities and has room for outdoor equipment. Parking for 2 vehicles in each Lodge. Access to farmland and private wildlife trails with maps and a guide provided. A warm welcome awaits all our visitors along with a welcome pack of wine, welshcakes & milk. Luxury extras can be delivered - Fine Welsh food hampers, award winning butcher's meats, home baked cakes and fresh flower arrangements. Children are welcome with comfortable accommodation for families, in addition to the highchair and travel cot, we can also provide a children's bed rail for a single bed, a baby bath, plastic plates, bowls, cups and cutlery, and safety electric socket covers. The enclosed garden is safe and secure with a fence and a gate. Activity wildlife walk observation sheet and walk guide leaflet. The accommodation has a comprehensive accessibility statement. All on ground level the lodges provide accessible bedrooms and bathrooms areas. A decked ramp gives access to the front glazed doors. The peaceful location is ideal for a romantic get away. Warm and cosy in the winter months, cool and spacious in the summer. A secluded location with window and door blinds give privacy to guests. The luxury spa hot tub is a great way to view the starry skies and spot the numerous shooting stars. We can provide hampers of fine welsh foods, local butcher's meats, delicious chocolates and champagne. Located on a family farm, the lodges have their own Wildlife Walks straight from the door. Maps and guides will show you around two nature trails where you can discover the wildlife and learn about the farm animals and the Welsh rural landscape. Bird feeders are positioned outside your kitchen window and the numerous bird books help you to keep a record in the nature journal provided for guests. Bird nesting boxes encourage birds to nest close by. The private pond attracts visiting wildlife and viewing benches are located for guests to sit and enjoy all that nature has to offer. The nearby lakes and reservoirs are a fisherman's dream and there is plenty of advise and information. The Lodges have a Gold Award in the Green Business Tourism Scheme, given for it's commitment for being Eco-friendly and providing sustainable tourism accommodation. Solar panels help provide the electricity and a newly installed Eco Air to Air cooler system provides warm or cool air, as well as the economical underfloor heating in the winter months. Set in a rural farm location on it's own site, the lodges are nestled within the landscape. Local Welsh Wine and Welsh cakes and Welsh Tea are part of the welcome pack, with optional orders for hampers of local fine Welsh foods. Farm eggs can be purchased from the nearby farm and a Vegetable stall has seasonal farm produce for sale. An abundance of Nature Reserves offer everything for you to enjoy the wildlife and scenery. Cyclists can enjoy cycling to the nearby town on a county lane and there are cycle paths that take you on a tour around the Elan Valley Reservoirs. Fungi Forays are an option by an experienced fungi expert and writer of foraging. Lon Lodges offer two lodges which sleep 6 persons in each lodge and a total of 12 persons, if both lodges are booked together. The open plan living room and kitchen area is a great space for communal use and the patio doors lead out onto the garden deck and outdoor seating for a family or group gathering. Extensive information on local eating places is provided and the owners can help with arranging a taxi service and advise on activities during your stay as well as pre-ordered special occasion surprises to your loved ones. 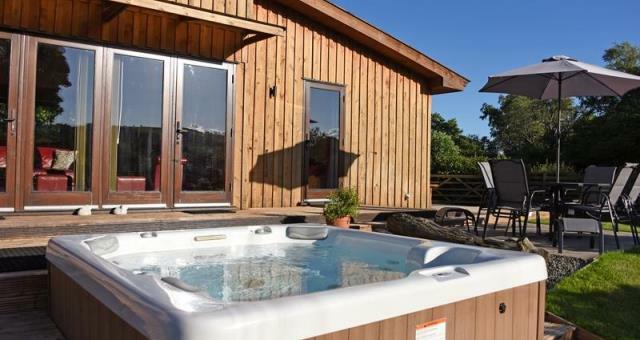 Award Winning 5-star self-catering lodges, offering a special holiday experience with private spa hot tub in the heart of Mid Wales and the Cambrian Mountains. Private hot tub. Enclosed garden with furniture. Underfloor heating. Non smoking. Children welcome from any age. The Lôn Lodges are situated on a country lane (signposted Abbeycwmhir) off the A44 between Crossgates and Rhayader, near the village of Nantmel.